Low-wall units have become increasingly popular within the air conditioning industry. Having an air conditioning unit located low down on a wall can be very useful, especially when you have dwarf walls, e.g. in loft conversions or conservatories. 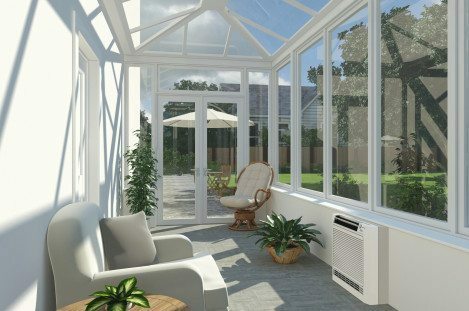 They provide both cooling and heating and will provide the perfect climate, all year round. The Air Conditioning Company supply low-wall aircon units from all the major brands including Daikin, Mitsubishi, Samsung and Fujitsu. We are also the only air conditioning installer in the UK to offer a 10-year warranty on all our installations. If you are looking for a low-wall air conditioning unit to be installed in your home, office, or shop, then get in touch. We offer a free site survey and expert advice to all our customers. The reason for their popularity is in the name! Low wall-mounted AC units are installed at low-level, which makes them more aesthetically pleasing than traditional high-wall aircon units because they remain outside your primary line of vision. Many of our clients have replaced their conventional gas-fired radiators with low wall-mounted air conditioners. There are significant advantages to this; firstly, they will provide both cooling and heating throughout your premises, and secondly, the units we install can be far more efficient than typical radiators so they will save you money on heating. Although low-wall units normally have a lower maximum cooling output when compared with other types of air conditioning systems, you can install multiple units for larger rooms in the same way that you would have multiple radiators. Low wall-mounted air conditioners are extremely efficient, and the inverter technology (included in all the units we recommend and install) can provide years of reliable and economical service. These units are so efficient that the government has introduced a scheme to encourage domestic consumers to install air conditioning systems to both heat and cool homes. For domestic or residential installations, you now pay just 5% VAT rather than the usual 20%. One of the main reasons for this is that the heat pump and inverter technology on our split air conditioners can be much more efficient than traditional methods of heating e.g. radiators and electric heaters.